We as horsemen and women have a long history of building, maintaining and riding our local trails. 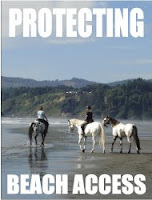 So why then would so many of us have objections to the equestrian trail project slated for Little River State Beach? The reason is simply that there is a perfectly fine existing trail that ties into county trails to the south. The new isolated trail would put horses right next to the road with obvious and unaddressed safety concerns. We are also not in favor of tearing up undisturbed habitat when it is completely unnecessary. In an effort to gain local equestrian support for this project we were told by State Park personnel several years ago at the onset of this project two important things that turned out to be not exactly true. One was that we were “not allowed” to ride where we have been for decades. The fact is State Parks had a no restrictions policy that did not prohibit us from enjoying our horses on long established trails. 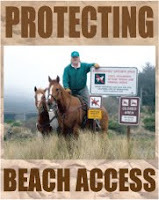 Second was that we were also led to believe that State Coastal Commission representatives had stated that they would not allow horses on the existing trail slated for pedestrians only. So far State Parks although asked several times, has not provided the identities of those representatives. The two Coastal Commission personnel recently contacted indicated there would not be any problem with shared use. This shared and existing use would not require any new construction. These two misleading presentations led us to believe the only way we would be able to use our horses on this public land was to support this project.. Admittedly we were caught of guard as we had for decades enjoyed a mutually beneficial relationship with State Parks. We would much rather see monies and efforts directed toward restoring and replanting the area at Little River that was bulldozed a few years ago. State Parks has said funding was limiting their permit obligations to replant. Another disturbing element of the trail part of this project is that while perfectly good, safe trails have been and are being used in this area the new trails would involve using heavy equipment to tear up undisturbed habitat. We have communicated this to the State Parks project manager and acting District Supervisor this past year with no response that addresses this. Removing a significant part of the County frontage road is also a inexplicable part of this project. State Parks could better direct their limited energies to keeping more of our campgrounds open that benefit local economies and give families inexpensive summer camping opportunities. While horsemen and women will continue to support much needed multi use trails in our community this project has become an example of what does not meet our needs. With such limited resources we can do better for our environment and our valued recreational systems. We plan to have a gathering of the horse clan at Clam Beach tomorrow Saturday the 14th at 1 pm to deliver the petition to State Parks personnel and have invited the press. The press seems pretty interested in this and hopefully State Parks will show up. What we would like to do is have any of you that can bring your horse trailers (and horses if you wish) and park along the west side of the frontage road from the north County Parking Lot (the middle one). This will be easier if you get off at the Crannell exit and come south. It is mainly for the photo and we would love to show up in force. We will present SP with the petition and then we can all go riding. Should be a nice day. Keep in mind this will carry a lot of weight into the future so please do what you can to show up. We should be done within a half hour or so. Call your friends and you don’t need a horse trailer.